Cool NASA styling with SIX Strap-Ons! Flies on "D", "E", and "F" motors.The Minotaur is a great looking and performing mid-size rocket. 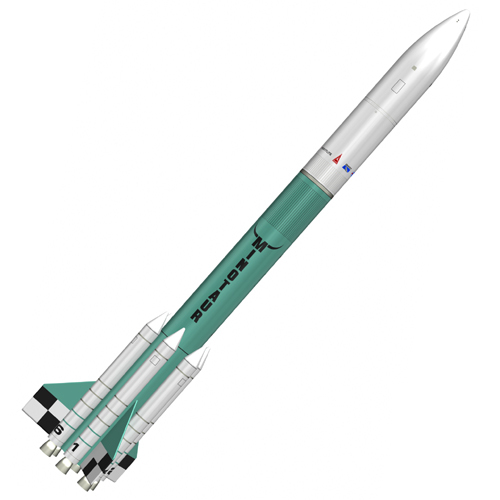 Over 62cms tall, the kit features blow-moulded plastic nose cone, laser-cut balsa fins, six boosters (for show only) and a rugged 29mm diameter motor mount. Flights with an Aerotech F32-6W will go to almost 600m. Then your Minotaur will recover gently on the big 45cms fabric parachute. Includes big, easy-to-apply self adhesive decals. Also includes 24mm engine mount adapter that allows you to use 24mm diameter engines.